A good detail starts by thoroughly removing all of the surface contamination as safely as possible. This citrus based degreaser is a perfect product for removing stubborn contamination on your paint, cleaning wheel wells, interior cleaning, engine degreaser and much more. Before washing spray this product on your lower panels or any area with heavy contamination build up and rinse with water. The P21S Auto Wash safely loosens and separates contaminates from the surface to save you from scrubbing the surface and possibly adding micro-scratches. This product is very safe and easy to use which is why it has become a favorite product of many top detailers. When you are going to wash your paint save yourself time and effort while improving your results with the P21s Total Auto Wash. EXTERIOR: Move car into shade, if possible. Spray surface with cool water if hot or covered with loose dirt. Spray directly onto heavily soiled areas (insect-laden, gas stained. heavy exhaust soot, etc.). Scrub and distribute using wet sponge or soft brush. Rinse with cool water, until no sudsing is noticeable. Note: Do one section of car at a time. Do not allow P21S to dry on surface. Alternate method: Add several ounces of P21S to bucket of warm water and wash as usual or spray P21S into damp sponge, scrub, then rinse thoroughly until surface feels "squeaky" to the touch. ENGINE: Insure engine is cool, then spray fine mist of P21S over engine. Turn hose on to highest pressure, rinse with sharp jet of cool water until surface feels "squeaky" to the touch. Start Engine to help drying process. UNDERCARRIAGE: Spray fine mist under rocker panels, into fender wells. Rinse with sharp jet of cool water. INTERIOR: Add several ounces of P21S to bucket of clean, warm water. Wash interior areas with sponge. Rinse with sponge damp with fresh water. 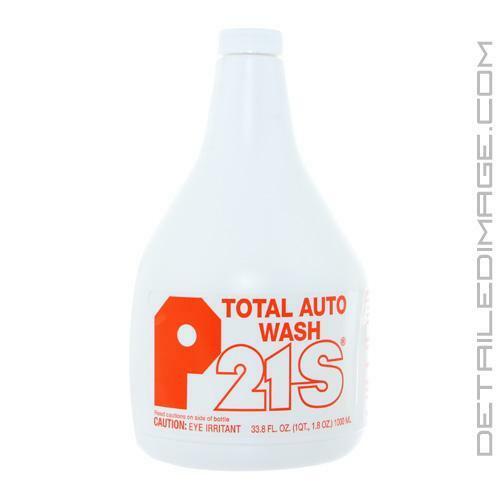 For heavily soiled areas, P21S may be sprayed directly onto stain, wiped off with sponge. Because of P21S' concentration additional rinsing may be required. If used on leather, re-oil after cleaning with P21S. Excellent product!! Very effective, easy to use. Primarily tried using it on my rims. It worked pretty good! It didn't take off all the brake dust saturdated areas (80%) but it was probably due to those areas being left on for years. I will try to hit the area again. But overall, very happy with the product. Excellent product! I will definitely buy more. Product performed as everyone has described. Sprayed the engine bay, waited a few minutes then rinsed off. The dust and grime melted away leaving a clean engine. Next I will experiment with it on the undercarriage of my pickup. Very nice product and easy to use. You guys always have outstanding customer service which is why I keep ordering from you.